Summary: A study conducted by researchers in Finland and Sweden has shown that dietary consumption of flaxseed increases levels of endostatin in breast tissue of healthy premenopausal women. Endostatin is a naturally occurring (endogenous) inhibitor of angiogenesis, or new blood vessel growth, and helps keep angiogenesis in check in healthy individuals. Notably, the increases in endostatin levels observed in breast tissue of healthy women were similar to those seen in women with early stage breast cancer who received tamoxifen, a hormonal therapy. This study is of particular interest because tipping the balance of angiogenesis regulators in the body toward a ‘pro-angiogenic’ state is one of the first steps in cancer development. Increasing levels of a natural inhibitor of angiogenesis, like endostatin, with food presents a potential, non-toxic alternative to drug therapy. A study conducted by researchers in Finland and Sweden has shown that regular consumption of flaxseed, also known as linseed, increases levels of a natural angiogenesis inhibitor called endostatin. In the study, healthy premenopausal women who had 25 grams of freshly ground flaxseed added to their daily diets had significant increases in levels of endostatin in their breast tissue. Endotatin is an endogenous (naturally occurring) substance in the body that inhibits new blood vessel growth, or angiogenesis. It also serves as a counterbalance to pro-angiogenesis proteins, such as vascular endothelial growth factor (VEGF). In many types of cancer, the balance of angiogenesis regulators becomes tilted in favor of VEGF and other angiogenesis stimulating proteins, while angiogenesis inhibitors in the body, like endostatin, become suppressed. Once angiogenesis has been “switched on”, tumor growth can continue unchecked. While endostatin as a cancer therapy failed in late stage clinical trials, it may still have considerable utility for cancer prevention. Of interest in this study, flaxseed increased levels of endostatin in breast tissue as potently as the hormonal therapy tamoxifen. Tamoxifen is a standard therapy for breast cancer in premenopausal women whose tumors are estrogen receptor positive (ER+), but its use can be associated with significant side effects, such as blood clots. Flaxseed contains high levels of ligans, a type of phytoestrogen that has been associated with a reduced risk of breast cancer. High dietary consumption of foods rich in phytoestrogens, such as soy, is common in East Asian societies where there is a much lower incidence of breast cancer than in Western countries. In conclusion, this is one of the first studies to show that a particular food can raise levels of an endogenous inhibitor of angiogenesis in the body. 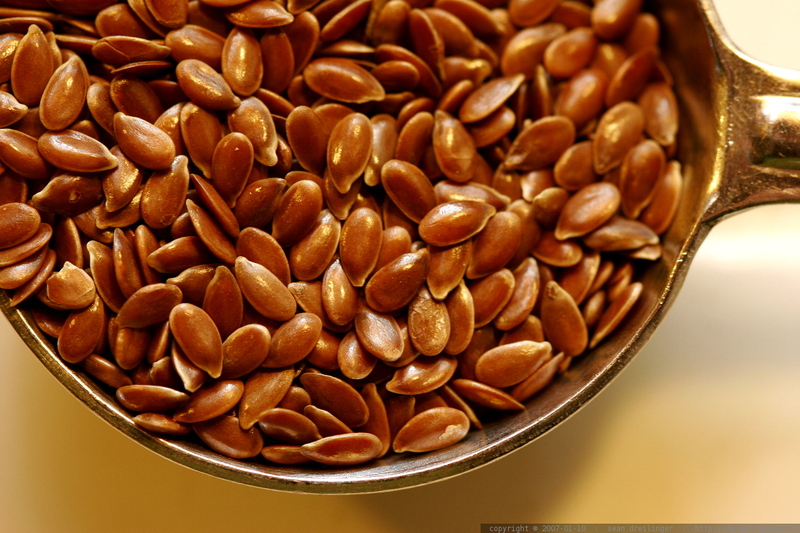 Further studies of longer duration are required to clarify the effects of flaxseed on healthy breast tissue for possible cancer prevention. Nilsson Åberg UW, Saarinen N, Abrahamsson A, Nurmi T, Engblom S, Dabrosin C. Tamoxifen and flaxseed alter angiogenesis regulators in normal human breast tissue in vivo. PLoS One 2011;6(9):e25720.